Here's a few videos I have about various aspects of learning to paint. I'm adding to these constantly, and am currently working on a series of flower painting demonstration videos, so this page will be growing! Subscribe to the mailing list to keep up to date on new videos and demos. For realist artists, getting colour right is the key to creating beautiful, engaging pictures. 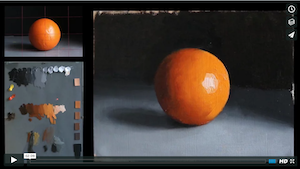 In this set of videos, I demonstrate three exercises that will help you unlock colour and take control of your palette, and then show you how to apply the principles learned to painting in the real world. There's about two hours of video to download or stream. Pay what you want. A detailed description of my method of using Munsell to help me get more accurate colour - and to (hopefully) create more beautiful paintings. 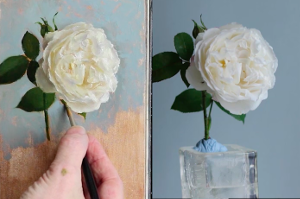 I demonstrate the method in detail through a flower painting. There's about an hour and a half of video to download. Pay what you want. 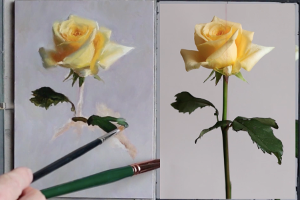 In over an hour of video demonstration, I take you through my flower painting process in detail.